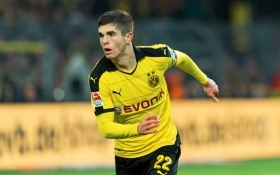 Chelsea are understood to have made an official offer to sign Christian Pulisic from Borussia Dortmund during the forthcoming transfer window. The USA international recently voiced his ambition of playing in the Premier League in the future and this has witnessed him linked with the Blues in the past few days. According to Evening Standard, the Blues are said to have made a formal offer for the Dortmund attacker after holding preliminary talks with the Dortmund hierarchy. Nonetheless, the bid made remains below Dortmund's £70m asking price, though they remain optimistic of pushing through a deal at the turn of the year. Blues boss Maurizio Sarri is understood to be eyeing a new wide player with Pedro and Willian having already entered their 30s while the future of Eden Hazard continues to remain uncertain beyond the current campaign. Chelsea returned to winning ways over the weekend with a 2-0 derby win over Fulham and they are presently occupying the third position on the table with 31 points.